Howard John "Sonny" Pauly, 81, passed away Sunday, August 26, 2018 in the presence of family and friends at his Portland, Oregon home following a two-year battle with cancer. Sonny was the eldest of three children born to William and Catalina Pauly. 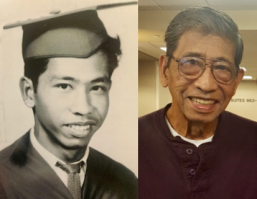 At his birth on May 18, 1937, the family lived in Manila, Philippines but immigrated to the United States when Sonny was eight years old. He graduated from Compton High School in Compton, California and shortly thereafter began a life-long career as a welder at Associated Piping and Engineering in Compton. His natural mechanical aptitude and problem solving abilities lent themselves to several unique creations including an antique fork faucet handle, and the "Bonneville Slingshot" (featured on YouTube), which improved Sturgeon fishing success on the Columbia River in Oregon. One of Sonny's greatest joys was fishing. He was known for reeling in a catch where others were failing. He was successful, he said, because he could tell the location certain fish were biting, and when, by "reading the waters". His skill as a fisherman earned him the honorary title of "a Fish Whisperer". He is survived by the love he called his "greatest catch" in life, his wife of 31 years, Arley (Watkins) Pauly. He is also survived by his son Jeff Pauly, his daughter Jeanne Harrington, step-daughters and step-sons whom he loved as his own: Nora Crutchfield, Wanda DeVore, Glen Brown, Kim Guerrant, Clint Brown, Shana Ostrander, Tahnee Barnes, and Tarah DeGeorge. He is also survived by his brother William Pauly, his 19 grandchildren, 8 great-grandchildren, many nieces and nephews, as well as extended family and friends. He is preceded in death by his father, William Pauly, his mother, Catalina Pauly, and his sister Annabelle "Annie" Kapper. A reception to celebrate his life and to share good memories will be held Thursday, August 30, at the family's residence between 2-5 p.m.